Miss Priss Tea Co. is an upscale mobile tea parlor that seeks to bring a classic tradition back to modernity. With a wide array of antique bone china and petite bites of delicious fare typical of an English-style afternoon tea, we would be delighted to enhance your wedding day with our bridal suite tea service. 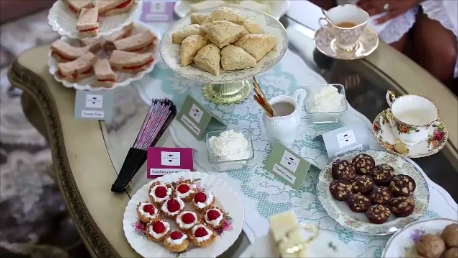 Treat your bridal party to premium loose leaf teas, finger sandwiches, and miniature pastries while you have your hair and makeup done. Most brides forget to order food for this segment of the day, but YOU will be prepared. Miss Priss Tea will be there not only to provide nourishment but also an elegant experience perfect for photos that will last a lifetime.